A young soccer player in my church recently wrote an article that appeared in our local newspaper. In the article, he described soccer — or "football" as it is known in most parts of the world — as consisting of long periods of continuous play with very few goals. He went so far as to say that an ideal soccer match often ends in a score of one to zero. Well, in some sense, ethical Christian living is a bit like an ideal soccer game. In the final analysis, we are in pursuit of a single grand goal — namely the ultimate triumph of the kingdom of God. But this is not a goal we can reach instantly. In fact, God's people have been striving toward this goal for thousands of years, and we have yet to reach it. Nevertheless, all our thoughts, words and deeds should contribute to the goal of glorifying God through the triumph of his kingdom. 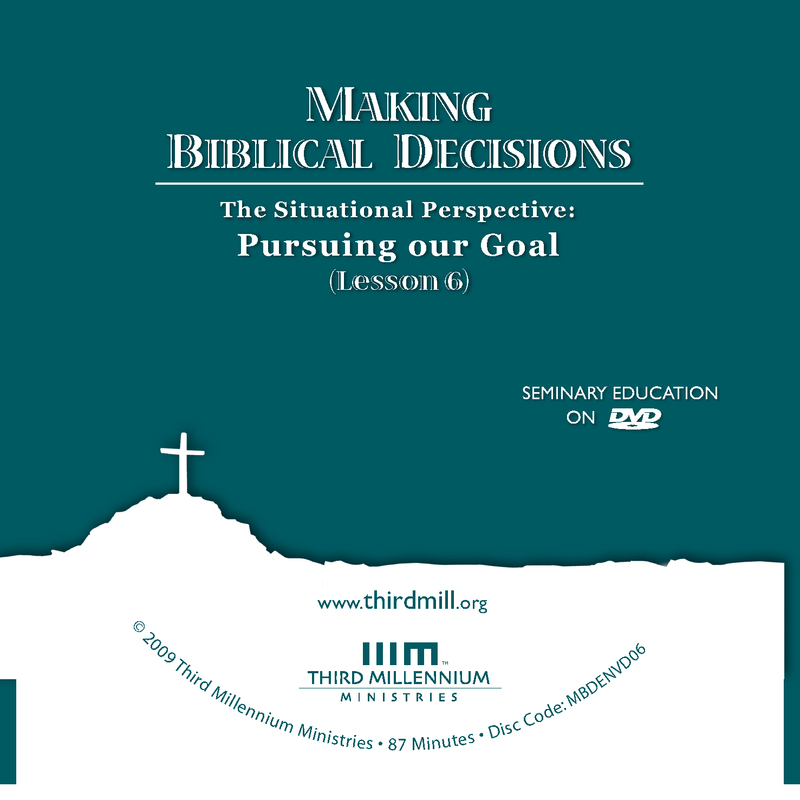 This is the sixth lesson in our series Making Biblical Decisions , and we have entitled it "The Situational Perspective: Pursuing our Goal." In this lesson, we will focus on the overarching goal that God has laid before us, namely, the success and triumph of his kingdom as it spreads from heaven to cover the whole earth. Throughout these lessons, we have emphasized that ethical judgment involves the application of God's Word to a situation by a person. This summary highlights the fact that there are three essential aspects to consider in any ethical question, namely, God's Word, the situation, and the person making the decision. These three concerns of ethical judgment correspond to three perspectives that we should take toward ethical issues: the normative perspective, which focuses on God's revealed norms; the situational perspective, which concentrates on the importance of situations and circumstances; and the existential perspective, which directs attention to human beings. In the previous lesson we introduced the situational perspective on Christian ethics by emphasizing how important it is to understand the facts of our situation. And beyond this, we also saw that two kinds of facts play a special role in ethics: the goals we seek to accomplish, and the means we use to reach these goals. In this lesson, we are turning our attention to just one of these situational considerations: the goals of Christian ethics. Specifically, we will focus on the kingdom of God as the ultimate or final goal of Christian ethics. Our lesson will divide into three main sections. First, we will explore the circumstances of the kingdom of God, answering questions like: What is the kingdom? and How does it manifest itself in history? Second, we will consider life in the kingdom, focusing on our personal experiences within the kingdom of God, and evaluating them in terms of the general goals that God has set for us. And third, we will describe the program for the kingdom, looking at some of the more specific and immediate goals God has ordained as means to reaching the overarching goal of the kingdom. Let's begin by turning to the circumstances of the kingdom of God. We will discuss three aspects of the circumstances of the kingdom. First, we will explain the importance of the kingdom of God, and show why it is proper to say that God's kingdom is the ultimate goal of Christian ethics. Second, we will identify the components of the kingdom, the constituent parts of the reign of God. And third, we will explore the development of the kingdom, the ways it has progressed throughout history. Let's first turn our attention to the importance of God's kingdom. As we have mentioned in prior lessons, ethical judgment always has the proper goal in mind. And as we have said repeatedly, the highest goal of ethics is the glory of God. But what we also need to realize is that God's glory is manifested in his kingship and his kingdom. From Genesis to Revelation, Scripture reveals that God is the king over all creation. And it teaches that the ultimate goal of history is to display God's kingship through the reign of Christ. In this sense, we can think of God's kingdom as the overarching story of the whole Bible. Now to the King eternal, immortal, invisible, the only God, be honor and glory for ever and ever. Amen (1 Timothy 1:17). So, when we speak of the glory of God as the highest goal of ethics, we are also saying that the kingdom of God is the highest goal of ethics. Now, the Scriptures have many things to say about the kingdom of God as the goal of Christian ethics. But to introduce this subject, we'll focus on some of the ways that Jesus spoke about the kingdom of God in the Sermon on the Mount, found in Matthew 5–7. We'll consider three specific times when Jesus spoke of the kingdom of God as the goal of ethics during his Sermon on the Mount. First, we'll look at his discussion of the kingdom of God in the Beatitudes at the beginning of the Sermon. Second, we'll consider the Lord's Prayer. And third, we'll focus on Jesus' teachings about earthly needs. In each of these sections, Jesus indicated that the kingdom of God must be the main priority of our lives. Let's begin with the Beatitudes, found in Matthew 5:3-12. A beatitude is a statement about blessedness. Accordingly, Jesus' statements Matthew 5:3-12 are called "beatitudes" because they each begin with the phrase "blessed are" "blessed are". These beatitudes list many things that God blesses. In Matthew 5:3, the blessing was: "theirs is the kingdom of heaven." This same blessing was repeated in verse 10. Although Matthew used the phrase "kingdom of heaven" here, many scholars have noted that this term is unique to Matthew's gospel, and that it means the same thing as "kingdom of God." In verse 5, the blessing was: "they will inherit the earth." This was also a kingdom blessing, because it referred to the new earth that God will create when his kingdom comes in all its fullness. And in verse 9, the blessing was: "they will be called sons of God." Even this statement of blessedness refers to the kingship and kingdom of God. In the days of the Bible, human kings were often called "father" by their subjects. And the same is true in the Scriptures; God is often called our father because he is our royal father. So, in this verse, Jesus taught that God will be the royal father, the loving king of his blessed children. In one way or another, each of these blessings Jesus mentioned was closely related to the concept of the kingdom of God. And Jesus specifically set forth the blessings of God's kingdom as the reward or goal that was to motivate his listeners to live ethically. He presented the kingdom of God as an essential focus for Christian ethics. your will be done on earth as it is in heaven (Matthew 6:9-10). All four of these statements have a kingdom focus. In the address, "Our Father in heaven," God is acknowledged as our father, but notice that he is specifically described as our father in heaven. The image of heaven throughout the Bible is the same: it is God's throne room. So, when Jesus told his disciples to pray "Our Father in heaven," he had in mind that they pray to God as their royal father, the divine king enthroned in heaven, the great father of his empire. In the first petition, "hallowed be your name," Jesus instructed his disciples to revere God's name. Scripture often equates God's name with his person and authority. In the context of the Lord's Prayer, this is a petition that all creatures would bow to God because of his unsurpassed kingly authority. In the second petition, "your kingdom come," Jesus exhorted his disciples to pray for the fulfillment of God's kingdom on earth. This was in keeping with his teaching that God is extending his heavenly kingdom to earth. In the third petition, "your will be done on earth as it is in heaven," Jesus indicated that all creatures in heaven already obey God's will. But Jesus instructed us to pray that all creatures on earth would obey the divine king in the same way. So, once again we see that Jesus set forth the kingdom of God as a high priority for Christian ethics. Now that we have looked at the Beatitudes and the Lord's Prayer, we are ready to turn to Jesus' teachings about earthly needs. This passage appears in Matthew 6:25-34. Do not worry, saying, "What shall we eat?" or "What shall we drink?" or "What shall we wear?" … your heavenly Father knows that you need these things. But seek first his kingdom and his righteousness, and all these things will be given to you as well (Matthew 6:31-33). It is not wrong to give proper attention to earthly needs like food and clothing. But here Jesus made it strikingly clear that seeking the kingdom of God is not just one of many goals we have as followers of Christ. Of all the goals we have in life, our first or primary concern should be the glorification of God through the triumph of his kingdom on earth. So, we see that on several occasions in the Sermon on the Mount, Jesus made it very plain that the ultimate goal of the Christian life, the greatest end toward which we are to strive, is the glorification of God through the triumph of his kingdom. Having seen the importance of the kingdom of God as the goal of Christian ethics, we should examine the components of the kingdom to find out more precisely what its essential elements are. There are many ways to describe the kingdom of God, but we will speak of three main components of the kingdom. First, we will speak of the role of the king. Second, we will turn to the people or citizens of the kingdom. And third, we will look at the covenants that govern the relationship between the king and his people. Let's begin with the role of the king within the kingdom. Modern people often have a difficult time understanding what it means to say that God is the ruler of his kingdom, because many of us have never lived under the authority of a human king. But in the ancient world of the Bible, people were very familiar with kings and kingdoms. In those days, kings were expected to fulfill their responsibilities to the citizens of their countries. They were to protect and provide for them, and to treat them with kindness. Kings also had the legal authority to tax, to raise armies, and to regulate many aspects of life. Good kings ruled wisely to benefit their people; they worked hard to protect them from foreign powers as well as from natural and domestic problems. The Lord has established his throne in heaven, and his kingdom rules over all (Psalm 103:19). The kings of the earth belong to God; he is greatly exalted (Psalm 47:9). God's supreme rule as the king over all is a major theme that runs throughout the Bible. Notice that both David and Solomon sat on the throne of the Lord in Jerusalem. The throne still belonged to God, so that the human kings of Israel sat on it only as his vassals. Do not swear at all: either by heaven, for it is God's throne; or by the earth, for it is his footstool; or by Jerusalem, for it is the city of the Great King (Matthew 5:34-35). God ruled over Israel from his throne in heaven, and Jerusalem was still the earthly capital of his kingdom. Now that we have seen that God is the king over all creation, and king in a special way over Israel and the church, we should turn our attention to the people or citizens who live in God's kingdom. Since God is the emperor over all creation, there is a sense in which his reign has always been over every living person. But when the Bible speaks about the people of God's kingdom, it is usually referring to the people that God has called to himself in contrast to the people of the world who follow the ways of evil. The Old Testament commonly speaks this way about Abraham and his descendants. And the New Testament generally uses this language to speak about the church, since Christians of all races have been adopted into the family of Abraham in Christ. You … crowned [man] with glory and honor. You made him ruler over the works of your hands (Psalm 8:5-6). Referring to the creation account in Genesis 1, David indicated that humanity had been crowned and appointed ruler over the whole world and all its inhabitants. In short, God made human beings his vassal kings over creation. The Lord God had planted a garden in the east, in Eden; and there he put the man he had formed. And the Lord God made all kinds of trees grow out of the ground — trees that were pleasing to the eye and good for food (Genesis 2:8-9). Be fruitful and increase in number; fill the earth and subdue it (Genesis 1:28). So, we see that it was humanity's responsibility to populate the whole world, filling it with citizens of God's kingdom, and to improve it as God had improved the Garden of Eden. I will make you very fruitful; I will make nations of you, and kings will come from you (Genesis 17:6). In the days of Abraham, God narrowed his focus to a national level, concentrating on Abraham's descendants as his special kingdom within his broader rule of the world. This national focus culminated in Jesus, the final vassal king over God's people on earth. Jesus stood before the governor, and the governor asked him, "Are you the king of the Jews?" "Yes, it is as you say," Jesus replied (Matthew 27:11). Under the kingship of Jesus, the focus of God's kingdom became ecclesiastical, meaning that it was centered on the church. Through the gospel, salvation spread so successfully beyond the people and borders of Israel that the centerpiece of God's kingdom was no longer a single nation, but the church throughout the world. God's kingdom now includes people from every race and continues to spread to the ends of the earth. With your blood you purchased men for God from every tribe and language and people and nation. You have made them to be a kingdom and priests to serve our God, and they will reign on the earth (Revelation 5:9-10). Having spoken of the king and the people, we should mention a third component of the Kingdom: the covenants that govern the relationship between them. In the ancient world, suzerain kings often administered their great empires by imposing covenants or treaties upon vassal nations and their kings. These covenants typically mentioned the suzerain's goodwill toward the vassal, listed the vassal's obligations toward the suzerain, and stated the consequences of obedience or disobedience to these obligations. Similarly, throughout the Bible God administered his kingdom through covenants. His covenants expressed God's goodwill toward his people; listed the people's obligations toward God; and stated the consequences of obedience or disobedience to these obligations, specifically, blessings for obedience and curses for disobedience. It is common to speak of six major covenants between God and his people. The Bible speaks of God's covenant with Adam in Hosea 6:7; the covenant with Noah in Genesis 6 and 9; the covenant with Abraham in Genesis 15 and 17; the covenant through Moses primarily in Exodus 19–24; the covenant with David in 2 Samuel 7 and Psalms 89 and 132; and the final covenant in Christ in places like Luke 22:20 and Hebrews 12:23-29. These covenants were never at odds with each other. Rather, they successively administered and governed God's kingdom as it grew throughout history. From the very beginning, God's relationship with humanity has been governed by covenant. The covenantal nature of God's relationship to his people continued throughout the Old Testament in the history of Israel. And even the Christian faith of the New Testament is explained in terms of the new covenant in Christ. Understanding that God has always administered his kingdom through his covenant is very important for Christian ethics. To put it in terms of our lessons, biblical covenants indicate the facts of our situation: that God is our king and that we are his kingdom servants. They establish the kinds of kingdom goals God blesses. And they delineate many of the means we are to use to achieve the goals that he blesses. In short, our covenant relationship with God helps us understand how each aspect of our lives should work to bring glory to our great king. Now that we have explored the importance of the kingdom of God as the goal of Christian ethics, and looked at the components of the kingdom, we should turn briefly to the historical development of the kingdom, the contours that God's kingdom has exhibited and will exhibit throughout history. It has been a longstanding tradition to summarize the Bible's story in terms of three historical phases: creation, fall, and redemption. And we will follow this same basic outline. But we will call these phases by different names in order to highlight our kingdom emphasis. We will speak of the phase of creation as the time when the kingdom was in a state of initial peace. We will refer to humanity's fall into sin as humanity's rebellion against the divine king. And we will speak of the phase of redemption as a time of final peace that exceeds the initial peace of creation as God brings his kingdom to its glorious fulfillment. We will address these three phases in historical order, beginning with initial peace, continuing with humanity's rebellion, and concluding with the time of final peace of the kingdom. Let's turn our attention first to the period of initial peace. In the beginning, when God created the world, humanity lived in perfect harmony with God. Adam and Eve were obedient servants. And as a result, there was peace between God and humanity. As we have seen, during this period God appointed human beings to serve as his vassal kings. And at first, humanity fulfilled this role well, in perfect accordance with their obligations toward God. As a result, Adam and Eve were was blessed with close fellowship with God, and continued to live in the Garden of Eden where life was blissful and easy. The Lord will surely comfort Zion and will look with compassion on all her ruins; he will make her deserts like Eden, her wastelands like the garden of the Lord. Joy and gladness will be found in her, thanksgiving and the sound of singing (Isaiah 51:3). During the time of peace in the Garden of Eden, human life was full of joy and gladness, of thanksgiving and singing. In this initial period, the rest of the world was undeveloped. But in the garden, where human society existed, there was great peace. And as we read in Genesis 3, this was a world in which work and child bearing were relatively easy and full of joy. No enemy threatened war; no animals threatened violence; no sickness threatened health; no drought or flood or fire threatened to destroy homes and crops. But rather, God cared tenderly for Adam and Eve, and even walked and met with them in the cool of the garden. In short, this was a world in which all the components of the covenant worked properly to favor humanity. God, the great king, had shown incredible goodwill toward his people by creating them, placing them in an idyllic garden, and giving them authority over all creation. With regard to human obligations, the Lord required them to serve him and to obey him. And they did so without flaw. And with regard to consequences, humanity's obedience resulted in great blessings from God. This was the way God created the world for humanity, and this is still the way the world is meant to be. Sadly, the history of God's kingdom goes beyond this period of initial peace to a time of rebellion against God — a time when humanity broke their covenant obligations to the great king, and mutinied against him. We all know the story of humanity's initial rebellion against God. Genesis 3 records that the serpent tempted Eve to eat from the forbidden tree of the knowledge of good and evil, and Eve gave in to the temptation. She also gave some of the fruit to Adam, and he ate it, too. By sinning in this way, humanity violated one of their covenant obligations. And as a result, they received the covenant curses. In response to their rebellion, God threw Adam and Eve out of the garden and forced them to live in a world where the ground was hard to work, where childbirth was painful, where sickness and famine and wild animals and war threatened them and their children. They were still bound by the covenant obligations, but now they were experiencing the negative consequences of failing in these obligations. And this rebellion has characterized the world throughout history. Humanity has continued to rebel against the great king, and God has continued to punish humanity with covenant curses. He destroyed the whole world with a flood in Noah's day. He allowed disease and nature and war to ravage humanity throughout its generations. And throughout it all, humanity did not learn its lesson. Instead of turning to God in repentance and keeping our covenant obligations, we continued to rebel and to perpetuate the covenant curses. But mercifully, God did not abandon us to rebellion and curse. Instead, he determined to bring final peace to his kingdom, to return blessing to his people. Here, God explained that the offspring of the woman would crush the serpent's head. Theologians commonly call this the protoevangelion or "first gospel," because it was the first time in history that God offered to send a redeemer to rescue humanity from the curse of sin. In this sense, throughout the history of the world after the Fall, God was working toward the goal of the full redemption and success of his kingdom. The Old Testament tells us that the gospel was in operation, reconciling some people to God, and establishing peace between God and his redeemed people. But even though God always maintained a people who were faithful to him throughout the Old Testament, he did not restore his kingdom to the glory it had displayed during the days of initial peace. But during the earthly ministry of Christ, the restoration of peace took a huge leap forward as it reached the last stages of its fulfillment. Jesus was the redeemer toward whom the entire Old Testament pointed. He came to earth as God's vassal king, in order to reestablish a faithful kingdom on earth, and to spread God's heavenly kingdom over the whole world. He is continuing that work now. And when he comes again in Glory, Jesus will complete the restoration of the kingdom, bringing the whole world into glorious final peace with our divine king. Now that we have explored the circumstances of the kingdom of God, we are ready to turn to our second major topic: life in the kingdom of God. In this section, we will focus on the twofold goal God has assigned to us within his kingdom. Earlier in this lesson we showed that the most important ethical goal for us to pursue is the glory of God through the triumph of his kingdom. At this point, we will consider some practical implications of this goal, especially as it pertains to our lives as citizens of God's kingdom. In particular, we will be looking for answers to the question: "What kinds of goals are we to pursue as we seek God's kingdom?" Man's chief end is to glorify God and to enjoy him forever. You'll notice that the catechism describes a twofold goal. On the one hand, it says that we are to pursue the glory to God. And on the other hand, we are to pursue the enjoyment of God forever. Our discussion of the twofold goal of the kingdom of God will follow this same division. First, we will consider what it means to glorify God as our divine king. And second, we will talk about what it means to enjoy God in his kingdom. Let's begin with the goal of glorifying God as our divine king. In this section, we will explore the idea that God is glorified primarily through the triumph of his kingdom, and we will do this in two parts. First, we'll define the glory of God, and second we'll consider the matter of the glorification of God. Let's begin with the glory of God. But I will gain glory for myself through Pharaoh and all his army, and the Egyptians will know that I am the Lord (Exodus 14:4). In this passage, God indicated that the recognition of his glory, that is, his fame or reputation, would increase when the Egyptians saw that his power had defeated them. They would resent his glory, but they would still have to acknowledge it. Ascribe to the Lord glory and strength. Ascribe to the Lord the glory due his name; worship the Lord in the splendor of his holiness (Psalm 29:1-2). Whenever the living creatures give glory, honor and thanks to him who sits on the throne and who lives for ever and ever, the twenty-four elders fall down before him who sits on the throne, and worship him who lives for ever and ever. They lay their crowns before the throne and say: "You are worthy, our Lord and God, to receive glory and honor and power, for you created all things, and by your will they were created and have their being" (Revelation 4:9-11). Three times in this short passage we are told that God receives this worship while seated on his royal throne. And this is the consistent picture throughout Scripture. Now that we have seen what the glory of God is, and how it relates to his kingship, we should turn to the glorification of God. In this section, we will be asking questions like: "Why is God's glory our goal?" And "How can we increase our divine king's glory?" Then God said, "Let us make man in our image … and let them rule over the fish of the sea and the birds of the air, over the livestock, over all the earth, and over all the creatures that move along the ground." So God created man in his own image … God blessed them and said to them, "Be fruitful and increase in number; fill the earth and subdue it. Rule over the fish of the sea and the birds of the air and over every living creature that moves on the ground" (Genesis 1:26-28). When God created humanity, he assigned us a purpose. And that purpose was to rule over the earth as his vassal kings, spreading his rule and the blessings of his kingdom throughout the whole world. And under the vassal kingship of Christ, that is still our purpose. We are to improve the world, increasing God's rule and blessings. And we are to multiply citizens within his kingdom, teaching them to acknowledge, honor and praise our great suzerain king. And as we fulfill this purpose, God's worthiness, fame and reputation increase. And in this way, his glory increases as well. And we see this emphasis on God's glory repeated in many ways throughout Scripture. For example, the Psalms teach us to meditate on God's good works and power, which increases his reputation. And they teach us to sing about these things, which is a form of honoring and praising him. And the historical books record many of God's works of power, mercy and judgment. Through their records, they teach us to remember God's goodness and sovereignty, and they give us further reasons to praise him. The prophetic books, in turn, teach us to hope in God's future glory. And this hope is to be our motivation to pursue righteousness in this life. If you do not carefully follow all the words of this law, which are written in this book, and do not revere this glorious and awesome name — the Lord your God… (Deuteronomy 28:58). Essentially, Moses listed only one command here. But he described it in two ways. Simply put, revering God's glorious and awesome name is the same thing as carefully following all the words of his law. And this is because when we have a proper reverence for God and his glory, we express that reverence in obedience to all his commands. Jesus quoted from Deuteronomy 6:5 to teach that the commandment to love God is the foundation of all the other commandments. And of course, loving God includes recognizing and affirming his worthiness, as well as appreciating and honoring him. In short, loving God is one important way of glorifying him. Now, as important as it is for us to keep our hearts set on the goal of God's glory, glorifying God is only part of our twofold goal. We are also to enjoy God forever. So, let's explore this enjoyment of God that is such an important aspect of our chief goal. Now, when we speak of our own enjoyment as one of the primary goals of biblical ethics, some Christians are a bit surprised. After all, our standard for ethical living is supposed to be the character of God, not our own wants and desires. So, how are we to resolve this tension? How are we to reconcile our own desires for happiness with God's desire for a world that glorifies him and magnifies his kingship? Well, not surprisingly, the answer is that proper human enjoyment brings glory to God. We will speak of two considerations that indicate that human enjoyment of God actually brings glory to God. First, we will consider the role of humanity in God's kingdom. And second, we will turn our attention to the role of the law that God gave to rule his kingdom. Let's begin by looking at God's purpose for humanity as a means of bringing glory to the divine king. When God created the world, humanity's role was to populate and to rule over God's kingdom. But God did not simply want citizens who would serve him. God is a loving king. He is good and gracious and benevolent to us. And he wants us to love him. His ideal kingdom is not one in which we cower in fear of him and obey so that we can avoid punishment. Rather, in God's ideal kingdom everyone loves the Lord and shares fellowship with him and with his people. For the kingdom of God is not a matter of eating and drinking, but of righteousness, peace and joy in the Holy Spirit (Romans 14:17). The people of God's kingdom should be characterized by joy and peace. In other words, they should enjoy the blessings that their God provides. The kingdom of heaven is like treasure hidden in a field. When a man found it, he hid it again, and then in his joy went and sold all he had and bought that field (Matthew 13:44). God's kingdom is a cause for great joy. And the proper human response to the blessings of God's kingdom is happiness and enjoyment. It is worth noting that Jesus gave this teaching in the context of explaining the coming day of God's judgment. On that day, those who are faithful to God will inherit tremendous glory — glory that far surpasses any price we might pay in this life. And because of this coming glory, we should rejoice in our present participation in the kingdom, knowing that we are laying up treasures in heaven. Now that we have seen that proper human enjoyment brings glory to God because of the role of humanity in God's kingdom, we should turn to the role of the law, seeing how the rules of God's kingdom are designed and intended to bring us joy. God's law is the revealed standard by which he governs his kingdom, and we are obligated to live by it. And when we live according to the law, we receive the blessings God has intended for the obedient citizens of his kingdom. So, we can say that one role of the law is to instruct us to live in ways that lead to blessing and enjoyment. All who rely on observing the law are under a curse, for it is written: "Cursed is everyone who does not continue to do everything written in the Book of the Law" (Galatians 3:10). The law is a curse when we use it wrongly, such as when we try to earn salvation by our own good works rather than through the merit of Christ. And on several occasions, the Bible speaks in harshly negative terms about the misuse of the law. But far more frequently, the Bible speaks of the proper use of God's law as a great blessing to humanity. And this should not be surprising. After all, the law reveals God to us, teaching us how to please him and how to obtain his blessings. The law of the Lord is perfect, reviving the soul… The precepts of the Lord are right, giving joy to the heart (Psalm 19:7-8). God has given us rules to follow in order to produce joy in our lives. And those rules are his law. So, when we obey God's law, we enjoy him and we glorify him at the same time. We enjoy him because he blesses our obedience, and because it pleases us to bring pleasure to the God we love. And our godly joy brings glory to God by fulfilling his purpose, by acknowledging his worth, and by expressing thanks toward him. In all of these ways, the role of the Law shows us that enjoying God is an important part of God's goal for humanity. Now of course, in our present world, our enjoyment of God is often hindered by our suffering. But we need to remember that in God's plan for us, our suffering is actually a means to our further enjoyment of God. Passages like Romans 5:3-5, James 1:2-4, and 1 Peter 4:13 teach us that God uses suffering in the same way that a refiner uses fire to burn off the impurities of precious metals. In God's hands, our suffering is a tool that proves our faith and brings us to spiritual maturity, and that ultimately results in our joy. Redeemed humanity's experience of joy is a critical element in God's plan for his kingdom. By looking at the role he has assigned to humanity, and at the role he assigned to his law within his kingdom, we can see that part of God's ultimate goal for his redeemed people is that we enjoy him. And our experiences of joy bring great glory to our divine king. So far in this lesson, we have investigated the circumstances of the kingdom of God as well as life in God's kingdom. At this point, we are ready to turn our attention to our last main topic: the program for the kingdom of God. In this section, we will focus on more specific goals that God has assigned to the church as it builds the kingdom of God. In every age, God's plan for the world has been the same. It has always been his goal to establish his kingdom throughout the whole world by populating it with loyal and righteous citizens who turn the world into paradise for his glorious presence. But it is always important to remember that in every age God has given rather specific goals to tell his people how to accomplish this overarching goal. In this section of our lesson, we will look closely at two such instructions that God gave to his people at critical stages in the world's history. First, we will consider the Cultural Mandate, which God gave to Adam and Eve when he created the world. And second, we will look at the Great Commission, which Jesus assigned to the church immediately after his resurrection. Let's turn first to the Cultural Mandate. We will investigate the Cultural Mandate by looking at three considerations: First, we will offer a definition of the Cultural Mandate, explaining what it is and what it generally requires. Second, we will discuss the relationship between the Cultural Mandate and the creation ordinances of marriage and labor. And third, we will look at the different applications of the Cultural Mandate throughout the historical development of the kingdom of God. Let's begin by defining what we mean when we speak of the Cultural Mandate. We have already spoken about this command in terms of our obligation to spread God's kingdom throughout the world. But theologians also refer to this as the Cultural Mandate because filling and subduing the earth involves building human cultures where none have existed before. You will recall that when God created the world, the Garden of Eden was the only area that he turned into a perfect habitation for humanity, and the only place that was perfected enough for him to be present in his glory with humanity. It was humanity's job to improve and populate the rest of the world, expanding the community of God's people, and thus the place of God's glorious kingdom presence, across the globe. In this sense, the Cultural Mandate is the command to establish righteous, God-honoring human populations and societies, including the improvements to the world that accompany these societies. The focus of the Cultural Mandate is on populating an unpopulated world, building new societies, and turning the wild fields and wastelands of the world into beautiful, productive, life-giving gardens for the glory of God. Now that we have seen a basic definition of the Cultural Mandate, we are ready to address our second topic: the creation ordinances of marriage and labor, which represent some of the central concerns of the Cultural Mandate. There are many ways that God conveys his commands to us. For instance, most of the commands recorded in Scripture are verbal. That is, they are conveyed by words. And God also reveals his commands to us through natural means, such as through the world around us, including nature as well as other human beings. But God's commands can also be revealed through God's acts of creation. A creation ordinance is a command that was revealed through God's first acts of creation, when he made the heavens and the earth. As we have seen, the Cultural Mandate was a verbal command. Genesis 1:28 teaches us that God spoke the Cultural Mandate to humanity when he created them, commanding them to fill the earth and to subdue it. And some of the same things that God spoke in the Cultural Mandate, he also revealed through the creation ordinances of marriage and labor. For instance, the creation ordinance of marriage is based on the purpose for which God created two genders, male and female. We are all familiar with the basic elements of the marriage between Adam and Eve. First, Adam was created. Then God made Eve from Adam's rib. And finally, God presented Eve to Adam and they became husband and wife. For this reason a man will leave his father and mother and be united to his wife, and they will become one flesh (Genesis 2:24). Here, Moses indicated that God created both male and female human beings for the purpose of marriage, one man with one woman. God's purposes in creation are expressions of God's character. As a result, they are normative for all human beings. And so, when we see that he created humanity in two genders for the purpose of marriage, we must conclude that humanity is obligated to engage in marriage, and that marriage should be a union between one man and one woman. This does not mean that every individual is required to marry. But it does mean that the human race as a whole must perpetuate the godly institution of marriage. And the creation ordinance of marriage directly relates to the Cultural Mandate's command to fill the earth, to be fruitful and multiply. Simply put, Scripture instructs that children are to be born within marriage, and therefore marriage is a prerequisite for the multiplication of human beings. The Lord God took the man and put him in the Garden of Eden to work it and take care of it… The Lord God said, "It is not good for the man to be alone. I will make a helper suitable for him" (Genesis 2:15, 18). Adam, the first man, was created in order to labor in God's garden. And his wife, Eve, was created in order to help him with this task. So, when we read that God's purpose for humanity is that we labor on his behalf, we must conclude that we are morally obligated to labor on God's behalf. And this creation ordinance of labor directly relates to the Cultural Mandate's command to subdue the earth, that is, to establish human societies throughout the world. After all, if it was through effort and labor that humanity was to tend God's garden, certainly expanding this endeavor to include the whole earth also would have required substantial labor. As we have said throughout this lesson, building God's kingdom is the goal of humanity. And creation ordinances show us two of the most basic ways God has commanded us to work toward this goal. As a result, the church must always affirm and engage in marriage and labor. And when we do so, will we expand God's kingdom on earth, and bring him honor and glory. Now that we have explained the Cultural Mandate and its relationship to the creation ordinances of marriage and labor, we are ready to turn to the various applications of the Cultural Mandate in the different historical periods of the kingdom of God. As we have seen, the Cultural Mandate was given at creation, before humanity's fall into sin. At that time, God was at peace with his people. And because there was no sin within human society, the goal of the Cultural Mandate was simply to expand and develop God's kingdom, especially by multiplying citizens within God's kingdom, and reordering the natural world to form human societies. In this sense, the Cultural Mandate was originally a simple creative command rather than a redemptive or restorative command: human beings were to create more people through marriage, and to create ordered societies through labor. But with humanity's fall into sin, human culture was corrupted, and God cursed humanity because of sin. Among other things, this corruption and curse applied specifically to marriage and to labor. I will greatly increase your pains in childbearing … Your desire will be for your husband, and he will rule over you (Genesis 3:16). Notice that Eve's curse applied both to reproduction, which would now be extremely painful for her, and to marriage, which would now involve struggles and conflicts. Cursed is the ground because of you; through painful toil you will eat of it all the days of your life… By the sweat of your brow you will eat your food (Genesis 3:17, 19). Prior to this curse on the ground, the ground easily yielded to humanity's labor. By this curse, it became far more difficult for humanity to meet their obligation to subdue the earth and to spread God's kingdom geographically. Humanity has continued in sin throughout history, so that no human society properly manifests the kingdom of God on earth. But the Cultural Mandate still obligates us to marry and procreate, and to labor in order to spread God's kingdom to the ends of the earth. So, how are we to understand the Cultural Mandate in light of the world's corruption? The answer is that the Cultural Mandate now has an expanded application. The goal of the Cultural Mandate is to turn the entire world into God's kingdom on earth, fit for his habitation among his people. Before the Fall, this was to be accomplished simply by building new societies and cultures. But now the task is harder. Not only do we need to subdue and fill the earth with God's faithful people. We also need to restore and redeem fallen human society by purging sin from our cultures. In the midst of dispensing curses after the Fall, God presented the protoevangelion, or "first gospel," indicating that he would not abandon his creation to sin and curse. So, we see that both marriage and labor have redemptive qualities. Marriage and reproduction, as painful and conflicted as they had become, would eventually produce the Savior of the world. And labor, even though it was extremely difficult, would sustain the human race long enough to produce the coming Redeemer. And this pattern was to continue throughout history, eventually resulting in the restoration of the whole world. For instance, in Genesis 9, after the flood of Noah's day, God repeated the command to fill the earth. And he promised to sustain the world so that the human race could subdue it once again. And notice that as God applied the Cultural Mandate and creation ordinances to the world in Noah's day, it was a restorative and redemptive work. God had just destroyed the entire sinful world. And now it was up to Noah to rebuild it, to replace the destroyed sinful cultures with righteous, godly ones, and to repopulate the earth with human beings that would obey and honor the Lord. Similarly, in Genesis 15, 17 and 22, God promised that Abraham would have innumerable descendants, and that they would inherit not only the Promised Land, but eventually the whole earth. But there was also a redemptive aspect here. Abraham was to overtake the existing pagan cultures in the Promised Land, and to replace them with God's kingdom. And his descendants were eventually to spread this conquest across the whole world. And what was true for Noah and Abraham continued to be true throughout the Bible. For instance, in Deuteronomy 28, God confirmed these same Abrahamic promises in the days of Moses. And in Psalm 89, they were confirmed again to David and his descendants. And as we read in Revelation 11:15, Jesus will eventually rule over the entire earth, extending God's kingdom to every corner. And Hebrews 10:12-14 indicate that when Jesus does this, he will perfect both the world and the human race by destroying his enemies and completely redeeming and restoring believers. Moreover, Ephesians 5:25-27 teach us that when Christ comes into his kingdom, he will be married to the church. And according to Hebrews 2:13, Christ will have many children, because every believer is his child. As we have seen, the Cultural Mandate expresses God's program for his kingdom. But since the Fall, the outworking of this program involves a long and difficult process of redemption and restoration. Nevertheless, through things like marriage and labor, God is still using humanity to fulfill the Cultural Mandate. Of course, his kingdom will not be completed until Christ returns in glory. But when that day comes, the whole world will be turned into the paradise God has always intended. Now that we have a basic understanding of the Cultural Mandate in mind, we are ready to see what role the Great Commission plays in God's program for his kingdom. Our discussion of the Great Commission will divide into three parts. First, we will offer a definition of the Great Commission. Second, we will explain the implications of the Great Commission. And third, we will explore the relationship between the Great Commission and the Cultural Mandate. Let's begin with the definition of the Great Commission. The Great Commission is Christ's appointment of the eleven faithful apostles as his authoritative representatives and his charge to them to spread the kingdom of God throughout the whole world. This commission is commonly called "great" because it explains the overriding mission not only of the apostles, but also of the church they built. All authority in heaven and on earth has been given to me. Therefore go and make disciples of all nations, baptizing them in the name of the Father and of the Son and of the Holy Spirit, and teaching them to obey everything I have commanded you. And surely I am with you always, to the very end of the age (Matthew 28:18-20). The Great Commission contains three essential elements: First, Jesus' statement that he possessed the authority to build his kingdom, and to commission the apostles to do the work. Second, Jesus' charge to the apostles, instructing and authorizing them to build his kingdom. And third, Jesus' assurance that he would empower and protect the apostles in this endeavor. Even though the Great Commission was delivered only to the apostles, the Great Commission also binds the church to continue their work. After all, Jesus commissioned the apostles to make disciples of all nations — a job clearly too big to be done by only a few men. He also spoke of being with them to the very end of the age, indicating that he would see this work through to its completion at his return. These details indicate that Jesus always intended the apostles to carry out the Great Commission by establishing a church to do the work. Now that we have defined the Great Commission, we should turn our attention to its implications. In this section, we will consider the responsibilities the church has in light of the Great Commission. Go and make disciples of all nations, baptizing them in the name of the Father and of the Son and of the Holy Spirit, and teaching them to obey everything I have commanded you (Matthew 28:19-20). Jesus' instruction was not just to disciple people in every nation, but to expand the kingdom of God to include the nations themselves. In other words, he was looking for a geographical expansion as well as a numerical expansion. It is the church's job to evangelize everyone in the world, to bring believers and their families into the church, and to baptize them, and to teach them to obey everything that Jesus commanded. Throughout every generation, we must work to bring the whole world into the kingdom of God. Having defined the Great Commission and introduced its implications for the church, we are ready to turn to our final topic: the relationship between the Cultural Mandate and the Great Commission. We will consider three aspects of the relationship between the Cultural Mandate and the Great Commission: the similarities between them, the differences between them, and the priorities we should place on each. First, let's explore the similarities between the Cultural Mandate and the Great Commission. The similarities between the Cultural Mandate and the Great Commission are far reaching. For example, both obligate humanity to build God's kingdom, and even to make this our primary goal in life. And as part of this kingdom building, both require us to fill the earth with citizens in God's kingdom, whether by childbirth within marriage or by evangelism. And both require us to subdue the earth, whether by building societies or by discipling nations. We might summarize these similarities by saying that the Great Commission is Christ's application of the Cultural Mandate until he returns. Since Christ's earthly ministry, the Great Commission has been and continues to be an important way to apply the Cultural Mandate, and the church is obligated to follow it. In addition to these similarities, there are also some differences between the Cultural Mandate and the Great Commission that we should consider. One important difference between the Cultural Mandate and the Great Commission is that the Cultural Mandate is for every age and the Great Commission focuses on the special situation of the church prior to Christ's return. The cultural mandate was given at creation, and from that time on it has always been humanity's job to turn the world into a paradise fit for God's habitation. By contrast, the Great Commission was not given until the end of Jesus' earthly ministry, and it was specifically focused on the primary ethical responsibilities of God's people during the last period of the kingdom's history. So, whereas the Cultural Mandate is our fundamental responsibility, the Great Commission is the primary application of that responsibility during the present period of history. Another important difference is that relative to one another, the Cultural Mandate is a broad commandment, whereas the Great Commission is a narrow commandment. The Cultural Mandate requires humanity to marry and bear physical children in order to produce more human beings. And it also requires us to bear spiritual children who are loyal images of God in his kingdom. By contrast, the Great Commission emphasizes only the need to bear spiritual children by making disciples. And something similar is true of labor. Insofar as the Cultural Mandate aims at establishing God's kingdom throughout the world, it requires us to make disciples. But it also requires us to labor to build human societies. By contrast, the Great Commission requires us only to labor to make disciples. It does not include a specific requirement to build human societies. Finally, having looked at the similarities and differences between the Cultural Mandate and the Great Commission, we should turn to the matter of priorities. Very often in the history of the church Christians have disagreed over which of God's great mandates has priority over the other. Some have argued that Christians should concentrate their lives on the requirements of the Cultural Mandate by engaging in marriage, procreation and labor as they build human culture. Others have argued that these requirements have been superseded by the gospel mandate of making disciples through evangelism and teaching. This tension has very important practical significance for each one of us. Should we concentrate in one direction or the other? Should building human culture take precedence over gospel ministry? Or should gospel ministry have priority? In one sense, the Cultural Mandate has priority over the Great Commission in that it came first and expresses the ultimate goal of humanity, namely, the complete triumph of the kingdom of God throughout the entire world. But in another sense, the Great Commission has priority in that it applies the Cultural Mandate to the special circumstances of the present age, focusing on what especially needs to be done in our age. While we wait for Christ to return in glory one of our top priorities is to rescue men and women throughout the world from the power of sin through the proclamation of the gospel. As a result, there will be times when the explicit commands of the Cultural Mandate and the Great Commission seem to be in tension. When we feel this tension we should always be sure to pay special attention to the priorities of the Great Commission. If we find tension in our lives between the Cultural Mandate's commands of marriage and labor, and the Great Commission's commands to evangelize and disciple, we need to evaluate the Cultural Mandate in light of the Great Commission. We need to understand that the Great Commission's statements are normative interpretations and applications of the Cultural Mandate for our time. And in this sense, we need to give some priority to the Great Commission when it comes to modern application. I have not used any of these rights… I have become all things to all men so that by all possible means I might save some. I do all this for the sake of the gospel, that I may share in its blessings (1 Corinthians 9:15-23). In conclusion, the Cultural Mandate is God's overarching program for his kingdom. His ultimate goal is to spread his kingdom throughout all of creation, and to populate his kingdom with faithful citizens. And he has established creation ordinances such as marriage and labor as a means to accomplishing this goal. But humanity's fall into sin has made this goal impossible for us to fulfill. Therefore, God has begun to redeem the human race, in order that we might restore the world and turn it into his perfect kingdom. And the primary means he has provided for this redemption and restoration are evangelism and discipleship, those things he has commanded in the Great Commission. The Great Commission, then, is a normative application of the Cultural Mandate for this present age in which the final stages of the kingdom of God have already begun, but have not yet come to completion. In this lesson, we have seen that the kingdom of God is the ultimate goal of Christian ethics. We have considered the circumstances of the kingdom of God, including its importance, its components and its development; we have discussed our experience of the kingdom of God, looking at our twofold chief end; and we have seen the program for the kingdom as it is stated both in the Cultural Mandate and Great Commission. The success of the kingdom is God's ultimate goal for his creation. And therefore, it should be our ultimate goal, too. In fact, every one of our thoughts, words and deeds must serve the building of God's kingdom in some way. Insofar as they do, God approves and blesses them, so that they can rightly be called ethically good. And insofar as they detract from the goal of the kingdom, God condemns them, so that they are rightly called evil. Whenever we set out to make ethical judgments, we must account for the ways our decisions will impact the kingdom of God.